Spliced takes: 'Still in Memphis', the Star fans know what to expect from this series, more playing with a computer... but there are fools falling for it. I could make these myself on a computer. so i keep my money for something far more worthwhile thanks.i 100% agree with Lex on this one. I agree with Vince and Larry_G. This website is an important source for me to let me choose whether I'll buy a certain (import) CD or not. So, if you don't like a certain label and/or CD then don't post it here. This will certainly will not the last splice takes release by Star I guess, thus we can read in a few months from now on the same obnoxious words as "only fools will buy this release" over and over again? Keep your opinion by yourself please, we've heard it all before. I suggest that the people behind this website should write their messages as 'professional' as can be, keeping your opinion to yourself. Let me decide to be a "fool" or not, maybe I am such a fool I can permit me to buy (if i want to) these stuff and you don't? So, all those audience recordings, regularly promoted through this site, which sound as if they were recorded through a bucket of water from the next block, are fit for release then? Then of course let's not forget, FTD produce albums with 'takes that weren't fit for release' at the time and everybody falls over themselves to buy them. These FTD albums also use computers to generate the final outputs, and I have to say STAR sometimes make a darn better job than FTD and Sony. Let's also not forget how many people bought the 'Legendary' series because they were slightly different alternates / takes from what we had previously. STAR have produced some absolutely brilliant material in the past, video and audio. Personally, i don't care how they have done it, provided it is listenable, they can use a Sinclair ZX for all I care. 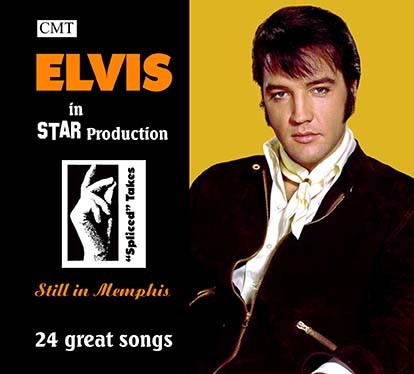 Would you rather the Elvis catalogue closed off and nothing else produced, stop the FTD and bootleg audience /studio recordings? If you want to stick your head in the wardrobe and just listen to original wax and vinyl 78's, 45's and 331/3's on your original Dansette record players, or just play the original sun series (because nothing else compares) that's fine, some may regard those as fools too. If you want to critisize the issue fine, but not the people who buy them, it's their choice. These represent great value for money, as mentioned just a few $'s / £'s and beats most audience concert recording anyday and I know because I have a cupboard full of those drink coasters and an empty wallet. Just sayin'!! In all honesty...Lex is right..its homemade computer playing nothing more...in the end they are using takes which didnt fit for release because they werent good enough..and put together to make a song makes it even worse in the end..and where and does it end ? Its an endless stories with possibly 1000 volumes.. I didn´t bought all these products you mentioned. For me it says: no. It is not a case of fools falling for it or what happened Gladyslove. It is a case of thinking up new angles to keep the interest after all these years -even for us oldsters. All Star products only cost a few dollars and are well thought out. If one wants to be cynical then the magnificent touring concert, Christmas duets, duetting with Lisa Marie, winning remixes like A Little Less Conversation/Rubberneckin' and the highly successful RPO releases are all abominations of the original recording........if that is your mindset !!!! Lord, have mercy ! Elvis, what happened ?